The Southampton Olive Oil Company is a family owned and operated specialty extra virgin olive oil, balsamic vinegar, and select gourmet foods boutique in the heart of Southampton, Ontario. We offer a carefully selected assortment of 100% extra virgin olive oils, flavoured oils, aged premium artisanal balsamic vinegars, and other gourmet products from around the world. Every day, our guests are invited to our ‘Tasting Room’ to taste one, or taste all! Have fun! It is our goal to create a warm and friendly atmosphere that, while attracting chefs and connoisseurs, also inspires the casual cook to infuse a little adventure and fun in their daily meals. We know you will enjoy our products as much as we do. Our mission is to provide you, our customer, with the freshest – highest quality – authentic – hard to find ‘FIRST CRUSH’- olive oils and artisanal balsamic vinegars unlike any of the commercial vinegars you have had. We also continuously strive to find, develop and research new recipes and cooking techniques that showcase our products and make you the most popular ‘home chef’ or entertainer in town! ALL our oils and vinegars are all natural, gluten-free, non-GMO, dairy-free and vegan (except for 2 that contain honey). In addition, all our Ultra Premium Certified Extra Virgin Olive Oils are ‘3rd Party Lab Tested & Sensory Evaluated‘, and all fused and blended oils are made by adding natural essential oils to the same Ultra Premium Certified oil. It began as our very own ‘AHAA!’ moment back in 2001 in the small village of Pergine Valdarno in Tuscany, Italy. 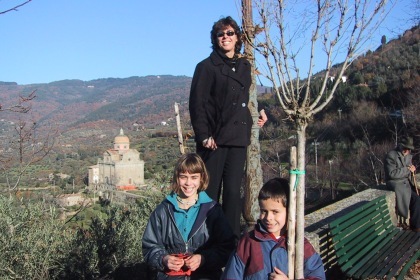 While traveling in November with our children Rita and Paul, by sheer luck we arrived at the time of ‘the olive crush’ in Tuscany. Upon tasting ONE DAY OLD extra virgin olive oil, we realized that what we had been buying and using back home was NOT the same as this ‘green tasting’ wonder nectar, and thus began our quest. Fast forward to 2012 in the Western USA when we first tasted and fell head over heels for these Ultra Premium Extra Virgin Olive Oils, all natural ingredient Blended Olive oils from around the world, and all natural dark & white Balsamic vinegars from Modena, Italy. After running out (and crying!) and searching to find more closer to home, we decided it was time to take matters into our own hands. Thus the beginnings of the Southampton Olive Oil Company. We are here 7 days a week 360+ days a year in the heart of Southampton, Ontario, as well having website sales available to you at all times. If you are in our area, drop in and say hi! We love to introduce people to our passion and can’t wait for you to have your own ‘AHAA!’ moment.